It is commonly known that the brighter and the more original the talent is, the more obstacles it encounters on its way. Rafael Arutyunyan – is now a well-known Estonian artist. I say “now,” because earlier, at the time of painting classes, drawing and sculpture, he experienced fierce opposition from his colleagues. “He does not consider others. He does not take his lead from us. He does not spend time with us at the gatherings” – so they said about Raphael. It took the colleagues more than a decade to realize that not only a proud man with a fully independent nature, but a genuine talent lived and worked next to them. Today, we can witness the same. This time – with Arutyunyana’s poetry. “Yes, he’s a great sculptor, indeed, but not a poet. He’d better carry on with the memoirs” – say all those skeptics, referring to a recently published book “Memories of one man”. Maybe these skeptics overlook the fact that the talent – is multifaceted. If a person is good at one thing, there is a high probability he will succeed in another. 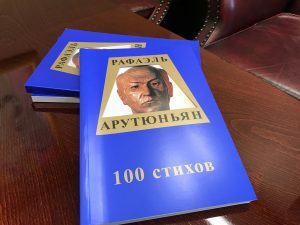 The publication of Rafael Arutyunyan’s poetic book “One hundred poems” that received mixed reactions of the literati colleagues, once again proves that the artist has the right to express himself with any means available. Arutyunyan’s poetry is an addition to his sculpture, painting and drawing. Moreover, Rafael does not consider himself a poet. Many a time, he speaks about this in his poems: “…I am not a poet, I do not play iambus or trochee, I simply rake out the dirt and decay of life”. He once said that he “writes not with his hand, but rather with his heart.” However, it could not be in a different way. Especially because the collection is dedicated to the blessed memory of his wife Irina. It was her care that helped a well-known artist to write this series of poems. The book “One hundred poems” – is not only a great tribute to true love. It is also a meditation on life and human nature. The author is laughing at himself, calling himself a “stump” and doubting about himself: “…whether my labour is pointless or useful, only you, Time, can resolve my doubts…” This book is like a sculpture, modeled by the author-sculptor, and now, the author-poet is carving words on paper, showing us how the artist’s thought is built and what constitutes poetry. Here is one more important note: this book – is kind of an album, which contains illustrations of some Arutyunyan’s works. The reader has a rare opportunity to understand through the poems what prompted the master to pick up a piece of marble or wood, clay or metal, to create something that would be called sculpture. Sculpture of a poem.